Two NWSL players were called up for the England World Cup Qualifiers while one player will miss some time with an injury and another returns from abroad. May 30th turned into a busy NWSL news day with Rachel Daly and Jodie Taylor called into the England Women’s National Team’s world cup qualifiers, Morgan Brian leaving Lyon after less than six months and Ali Krieger missing four to six weeks with an MCL Sprain. Daly, a forward for the Houston Dash, and Taylor, a forward for the Seattle Reign, will travel to Europe to help their squad in the UEFA Women’s World Cup qualifiers. 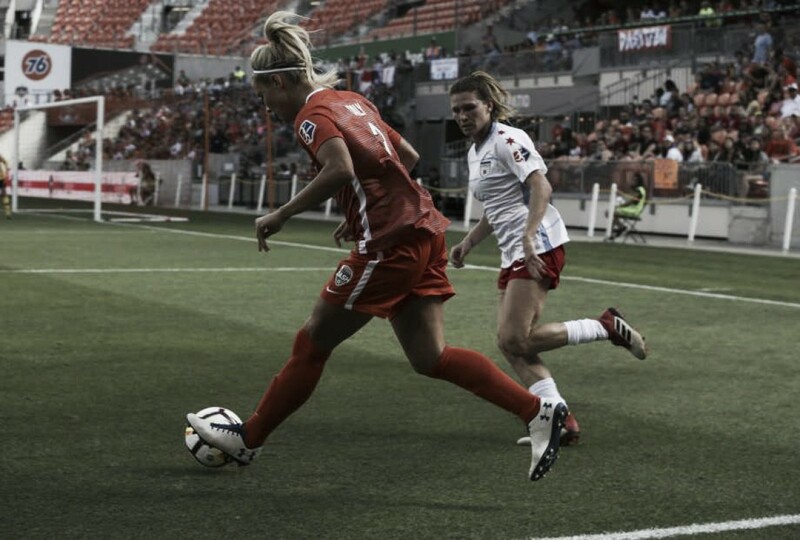 Taylor has become a mainstay for the Lionesses, making 37 appearances since 2014. She has wo goals for the squad already this year, the first in the SheBelieves Cup in March and the second in April during a World Cup qualifier. Taylor has three goals and an assist this year with Seattle. Daly has 10 caps with England, earning her first in 2016, but has not earned call-ups consistently. She has played primary defense for England, but her exceptional play in the NWSL this season, including her four goals since being moved back from defense, could earn her time up front. The US Women’s National Team midfielder has cut her contract with Olympique Lyon short to return to the United States and the NWSL. Brian had initially signed a two-and-a-half-year contract with the reigning Women’s UCL winners at the beginning of 2018, making the deal running through June 2020, but they have both agreed to terminate the contract making way for her return. Brian was drafted in 2015 number one overall by Houston. Injury and National-team duty limited her to 33 appearances in two and half seasons with the Dash. She was traded last season to the Chicago Red Stars for Kristie Mewis. She made just two appearances with Chicago, again due to injury, before heading off to France. It is unclear whether Chicago will retain her rights and see her play or if they will trade her rights to another squad. The Orlando Pride defender will miss the next 4-6 weeks after injuring her MCL in right knee during the Pride’s 5-2 win against Chicago on Saturday. Krieger came off in the 66thminute after a collision with Chicago’s Arin Gilliland. Krieger was traded from the Washington Spirit to Orlando before the 2017 season. With the Pride, she has played every minute of the 35 matches she has played prior to the injury.